HOUSTON  (July 19, 2011)  Houston home sales rose for the second time this year in June, with the average price reaching an all-time high and the median price achieving the highest level in nearly two years. The sales increase reflects the slowdown in home purchases that set in a year ago following expiration of the home buyer tax credit. The credit triggered a surge in home buying during the spring of 2010 that resulted in slower sales volume during the remainder of that year. According to the latest monthly data compiled by the Houston Association of REALTORS® (HAR), June sales of single-family homes edged up 0.6 percent versus one year earlier. That represents the first increase since January when sales volume rose 8.4 percent. The under-$80,000 segment of the market as well as homes priced from $250,000 and above experienced increased sales while the popular middle range, consisting of homes priced between $80,000 and $250,000, saw declines. Compared to June of 2009, a year with no unusual market factors such as Hurricane Ike in 2008 and the 2010 tax credit, single-family home sales were up 2.7 percent. "We see the effects of the 2010 tax credit in the June Houston real estate market report in the form of a drop-off in sales that took place a year ago once the credit expired," said Carlos P. Bujosa, HAR chairman and VP at Transwestern. "We expect these credit-skewed readings to taper soon, providing us with a more accurate gauge of market performance, but in the meantime, we are thrilled to see sustained home price appreciation." The average price of a single-family home rose 3.7 percent from June 2010 to a record high of $228,650. 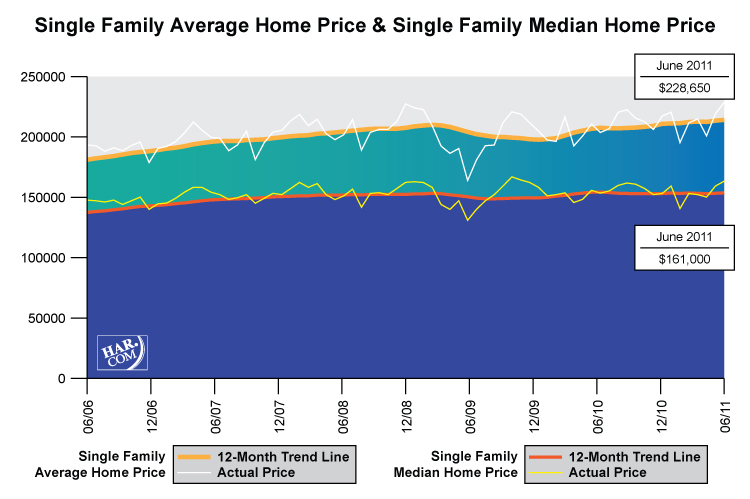 The June single-family home median pricethe figure at which half of the homes sold for more and half sold for lessincreased 2.2 percent year-over-year to $161,000. That is the highest median price since July 2009. Foreclosure property sales reported in the Multiple Listing Service (MLS) decreased 3.2 percent in June compared to one year earlier. Foreclosures comprised 18.7 percent of all property sales, down from 19.8 percent in May, 22.0 percent in April and 23.5 percent in March. The median price of June foreclosures declined 7.5 percent to $81,000 on a year-over-year basis. June sales of all property types in Houston totaled 6,520, down 0.2 percent compared to June 2010. Total dollar volume for properties sold during the month increased 3.3 percent to $1.43 billion versus $1.38 billion one year earlier. The month of June brought Houston's overall housing market largely positive results when all sales categories are compared to June of 2010. However sales volume gains for the month were skewed by the 2010 tax credit that affected a decline in home sales one year ago after it expired. Total property sales declined fractionally while total dollar volume rose on a year-over-year basis. The average price reached a record high while the median price recorded its highest level since July 2009. Month-end pending sales for June totaled 3,872, up 18.3 percent from last year. While not as high as the 35.4 percent increase recorded in May, the rate is considered higher than what is typically seen this time of year and is considered an ongoing reflection of the rapid pace at which 2010 sales went under contract in advance of the tax credit closing deadline. The number of available properties, or active listings, at the end of June dipped 4.8 percent from June 2010 to 51,342. The inventory of single-family homes rose to 7.9 months compared to 7.3 months one year earlier. That means that it would take 7.9 months to sell all the single-family homes on the market based on sales activity over the past year. The figure still compares favorably to the national inventory of single-family homes of 9.3 months reported by the National Association of REALTORS® (NAR). June sales of single-family homes in Houston totaled 5,571, up 0.6 percent from June 2010. This marks the first increase since January when sales volume rose 8.4 percent. The June number represents the greatest monthly volume of single-family homes recorded in Houston since May 2010. When compared to June of 2009, a year in which there were no unusual real estate market influences such as Hurricane Ike in 2008 and the home buyer tax credit in 2010, single-family home sales were up 2.7 percent. On a year-to-date basis, sales are down 5.4 percent. Broken out by segment, June sales of homes priced below $80,000 climbed 19.8 percent; sales of homes in the $80,000-$150,000 range dropped 11.6 percent; sales of homes between $150,000 and $250,000 dipped 0.7 percent; sales of homes ranging from $250,000-$500,000 rose 3.8 percent; and sales of homes that make up the luxury marketpriced from $500,000 and upincreased 1.5 percent. The average price achieved the highest level of all time in Houston while the median price reached the highest level since July 2009. At $228,650, the average price of single-family homes edged up 0.6 percent in June compared to one year earlier. At $161,000, the median sales price for single-family homes increased 2.2 percent versus June 2010. The national single-family median price reported by NAR is $166,700, illustrating the continued higher value and lower cost of living available to consumers in Houston. HAR also breaks out the sales performance of existing single-family homes throughout the Houston market. In June 2011, existing home sales totaled 4,811, a 4.7 percent increase from June 2010. The average sales price climbed 5.2 percent to $219,000 compared to last year and the median sales price of $152,000 rose 3.5 percent. The number of townhouses and condominiums that sold in June declined 8.6 percent compared to one year earlier. That became the fifth straight monthly sales decline for this housing type following a 14.7 percent hike in January. In the greater Houston area, 470 units were sold last month versus 514 properties in June 2010. The average price climbed 9.2 percent to $175,958 from June 2010 to June 2011. The median price of a townhouse/condominium declined 6.0 percent to $126,500. Demand for single-family home rentals continued to soar in the month of June, rising 19.2 percent compared to one year earlier. Year-over-year townhouse/condominium rentals jumped 19.5 percent. This demand has been largely driven by Houston's steadily improving employment landscape which has drawn consumers from around the country. According to the Federal Reserve Bank of Dallas' latest economic update for Houston, nonfarm payroll employment grew at an annualized rate of more than 3.2 percent in May to more than 2.57 million jobs. This brings the number of jobs added since the trough of Houston's business cycle to more than 81,600. Year-to-date, the average annualized monthly growth rate was 3.3 percent. Should that pace continue in the second half of 2011, Houston will have added nearly 84,000 jobs this year. The unemployment rate improved slightly to 8.4 percent, while the U.S. clocked in at 9.2 percent. 7.9 months inventory of single-family homes compares favorably to the national average of 9.3 months.